Leo returned our call within an hour regarding a roof leak. He came a few hours later, inspected the roof and attic area, took pictures and returned the NEXT day to do the repair since another rain storm was predicted later in the week. Prompt and professional! Owner, Leo Valdez, responded in a timely manner to help solve an indoor leak problem and the work was completed in a very timely manner. Three weeks later the leak was even worse and Leo returned with a willingness to get to the root of the problem. He was unable find the leak and he even showed me how dry things were under the tiles and felt. At that point I had an idea that the leak may be coming from a non-roof area and I discovered this to be the case. Leo stayed cool and promptly finished up the unnecessary roof work. I appreciated his professionalism and courtesy and, needless to say, paid him something extra for his time and troubles. Now I have to call in a plumber which I should have done in the first place. Contacted them to get a sewer inspection. They were fast and very professional. Stefany is the girl who answers the calls, and she is so kind and super-responsive. And she even remembered my invoice number!!! Also when I asked them about the inspection result, they sent me a drawing of the sewer line of the entire house and kindly explained to me what that drawing meant. Will definitely use them again. WOW is what I can say about Leo Valdez and the work he did on our roof!! We had a roof leak and Leo came out on a Sunday which was the day after I called! His price was very reasonable, he fixed several little other items which he spotted that would have become problems later on for us, and he was kind and courteous. With El Nino upon us, I was so glad Leo was the person we called as we have not had a problem since. I called him on Saturday and he was there in less than 30 minuts; he gave me best estimated price. Since my community does not allow any workers on Sundays; he was at work right on time early Monday. The job was done with 2 years warranty(normally one year is suggested) and he will give a release of liability to home owners or agents. I called other roofing companies and either did not respond or there was an answering machine and if there was a respond can not come on same day notice. I will suggest him to all my clients too. He takes his job seriously. We had a bad wind storm that blew a tile off and dislodged several others over the New Year's weekend. I located S&L in Yelp and based on Leo's reviews I called him. He sent out a worker that arrived on time and examined the damage. The worker gave the information to Leo and within 10 minutes Leo called back with the quote and set up the appointment for that Sunday. Leo arrived with his worker on time and repaired our roof better than it probably was when it was first installed. Here is what sets Leo apart. We have a playground with a clubhouse made out of wood in our yard. Two of the wood planks had come off the roof and were hanging. Leo without being asked saw those and climbed up and fixed them. I could see that Leo takes pride in his work and he made our two boys happy by fixing their club house. I would use Leo again for our roofing needs. S & L is the company I will call agin if ever I need a roof repair or a termite or dry rot repair. They came out and gave us a quote and than showed up on time to do the work. They worked with us on the price so we could get some other things done as well as our leak repaired. They were professional and personal and my wife and I feel so happy and secure again. We now say let it rain! Thank you Leo and Radolfo for a job well done! I would recommend you call them, you'll be glad you did. I needed a few cracked roof tiles replaced. Leo was able to come out quickly and gave me an outstanding - in a good way! - estimate. S&L was responsive, efficient, and great to work with. They really made it easy, and isn't that what you look for! I would easily recommend them. Owner Leo was on time and thoroughly explained my leakage problem including sharing smart phone photos so I didn't have to climb on to the roof myself. Leo and his helper, Rudy, did some extra things at potential leakage points for a minimal additional cost. The overall rate was very competitive. I received a one-year guarantee, although the proof of the pudding will be when the wet season arrives. I just wanted to say thanks for the terrific roofing service S&L Roofing provided to me and my wife Gail. I saw your add in the Yellow Pages, and noticed the words "no job too small." When I called your number, you answered personally and actually gave me your name (rare these days!). I told you about my roof, and you went out to my house to check things out within 45 minutes -- amazing! You called me from my house and offered to text me photos of the cracked tiles on my roof. After I approved the work to be done, you started on the work immediately, did a fantastic job at a very fair price, and finished right on time. It is so great to do business locally and to deal with a true professional. It is obvious that you care about the quality of the work you do, and I truly appreciate that you solved my roofing problem in less than one day! My wife Gail and I will recommend your company to all of our friends and neighbors!! I have used S&L Roofing for over 10 years on a number of my properties. They have always been honest and reliable. I have referred their services to friends and other associates on a number of occasions. Because of the excellent service they have provided me, I will continue to use S&L Roofing for all of my roofing needs. S&L Roofing has repaired my roof on two occasions over the years. On both occasions the service was prompt, courteous, thorough and reasonable in price. I would not hesitate to use S&L again! Before: During this roof repair in Foothill Ranch, CA, S&L Roofing conducted a complete roof inspection. We found slipped and cracked tiles which had allowed rainwater and other outdoor elements to deteriorate and destroy the felt paper under the tiles. After: This residential roof repair in Foothill Ranch, CA was completed within hours. 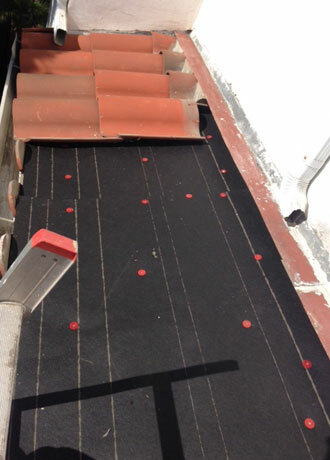 Our roof repair specialists carefully re-felted and replaced the cracked tiles and also reset any tiles that had slipped. 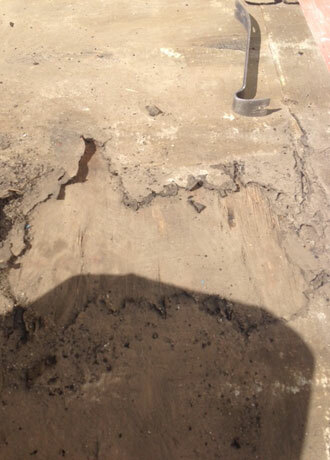 This was a quick and cost-effective roof repair.